"A new study by one of us (Elizabeth Setren) follows students participating in special education at the time they apply to charter elementary, middle, or high schools in Boston. By comparing students who randomly receive offers to attend a charter school to those that randomly do not receive lottery offers, the study estimates the causal impact of enrolling in a charter school for both special education and general education students. "The findings show that high quality general education can lead to remarkable progress for special education students. Attending a Boston charter school makes special education students 1.4 times more likely to score proficient or higher on their standardized tests, resulting in a 30 percent reduction of the special education achievement gap. "Gains extend to beyond just test scores: Boston charter enrollment boosts special education students’ college preparation. These students are over 1.6 times more likely to meet a key graduation requirement, over three times more likely to be eligible for a state merit scholarship, and over 3.8 times more likely to take at least one AP exam in a charter school compared to their peers who do not receive charter lottery offers. "Interestingly, special education students are less likely to receive special education services in Boston charters than their counterparts who enroll in the Boston Public Schools (BPS). Special education students who apply for a charter school lottery are two times less likely to keep their IEP and three times more likely to move to a more inclusive classroom setting if they randomly receive an offer to attend a charter. "The findings are robust to three common criticisms of charter schools: that high needs students do not enroll, that charters do not serve high needs students well, and that charters encourage lower performing students to leave. 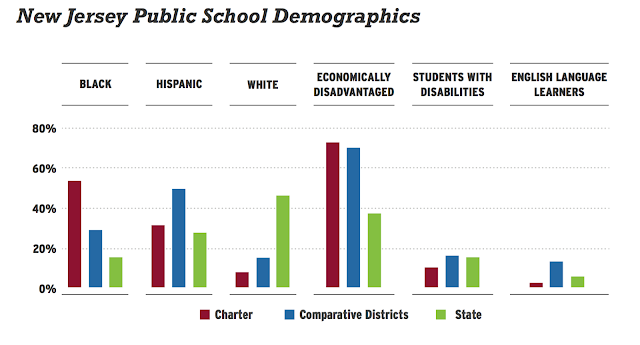 In recent years, the charter lottery special education applicants are representative of Boston Public Schools’ special education students in terms of level of services, disability type, and academic abilities. The enrollment numbers do not fully reflect this parity because charters are more likely to remove special education classifications and increase classroom inclusion. Achievement gains accrue even to the most disadvantaged students: students who had been in a substantially separate classroom in BPS and students who had the lowest test scores among special education students." "What is most important to understand, however, is that any effects from the SEII study can only be generalized to the population of students who actually enter the lottery. The report only acknowledges this limitation in its very last paragraph: “It is worth noting that the results apply to charter lottery applicants.... [M]y estimates may not reflect the effects of expanding the number of seats in Boston’s charter sector or requiring charters to recruit more special needs students” (p. 19)." This is a large limitation on Steren's work, especially since it's certain the population of special needs students applying to the Boston lotteries is NOT equivalent to the general special needs population. 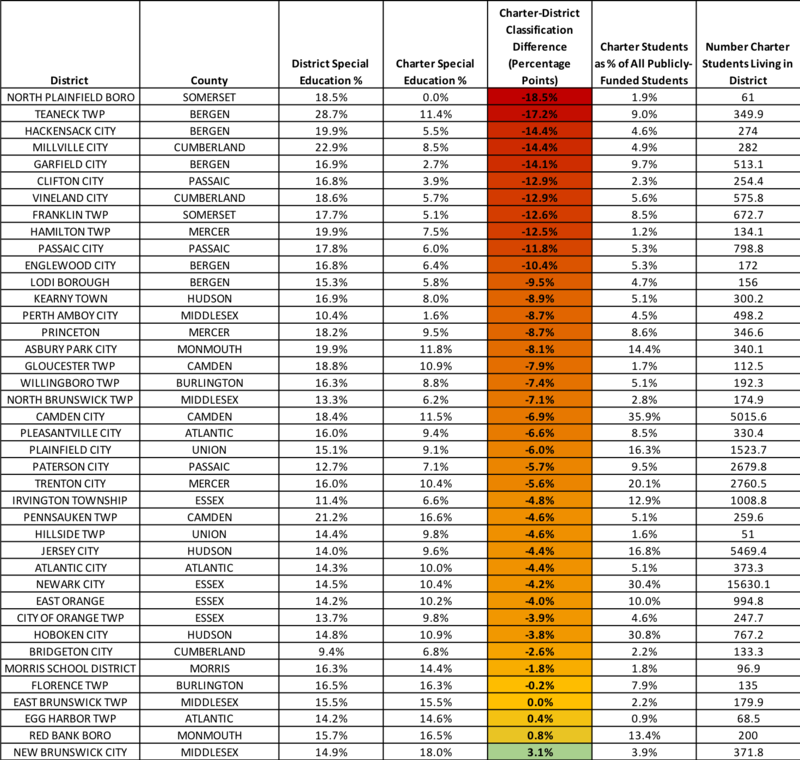 In any case, I don't understand what MA data has to do with NJ data. You write: "it's certain the population of special needs students applying to the Boston lotteries is NOT equivalent to the general special needs population." "Districts also receive a federal IDEA entitlement grant, which can be used to pay for special education services. In FY09, we will be distributing approximately $240 million under this program. The amount which each district receives is based on a complicated formula that includes a base amount (tied to the district's FY99 IDEA allocation) plus additional amounts reflecting the total number of students and the number of low income students in the district. "The municipal Medicaid (MuniMed) program provides reimbursement for certain medical services provided by school districts to eligible students, many of whom are also receiving special education services. MuniMed reimbursements exceed $100 million annually. These are treated as general fund revenues by either the municipality (in the case of municipal school districts) or the regional school district. Although not required to do so, many municipalities appropriate all or part of their MuniMed reimbursements back to their local school district to help defray future special education costs. "The state special education reimbursement program, commonly known as the circuit breaker program, was started in FY04 to provide additional state funding to districts for high-cost special education students. In FY08 approximately $200 million was paid to districts under this program. "For children placed in a school district outside their home town by the Department of Transitional Assistance or the Department of Children and Families, and for children who have no parents or guardians in the commonwealth, the reimbursement is 100 percent above the threshold rather than 75 percent." Jazzman: "In any case, I don't understand what MA data has to do with NJ data." The Massachusetts research exposes the fact that a look at raw ongoing enrollment data can be severely misleading in respect to both special education and ELL status. Here in Massachusetts one is not supposed to classify a student as in need of special services and an IEP if he or she is making adequate academic progress in a regular classroom. And one is supposed to stop classifying a student as ELL once he or she becomes proficient in English. Imagine a dozen kids entering a charter school classified as needing special education and another dozen classified as ELL. And within a few years all of the first dozen are making good progress in regular classrooms and the second dozen are all fluent in English. Zero SPED and zero ELL. While their identical twins in TPS are 24 SPED or ELL students. I suppose one could then look at the enrollment figures and slam the charter schools for insufficiently serving SPED and ELL students. But it mightn't persuade all comers. In respect to NJ, I remain open-minded, neither assuming the situation is directly similar to Massachusetts, nor persuaded that your critique is well-founded. Stephen, you accuse me of being "severely misleading" with no empirical evidence to back up your contention. All you ask me to do is "imagine" a hypothetical you have no evidence to support. You also commit a logical fallacy: if charter students are, indeed, declassified "within a few years," there would be at least some students classified - not "zero." Like your arguments against the evidence I've presented for cohort attrition in charters, you assume the least likely explanation on the basis of no evidence. 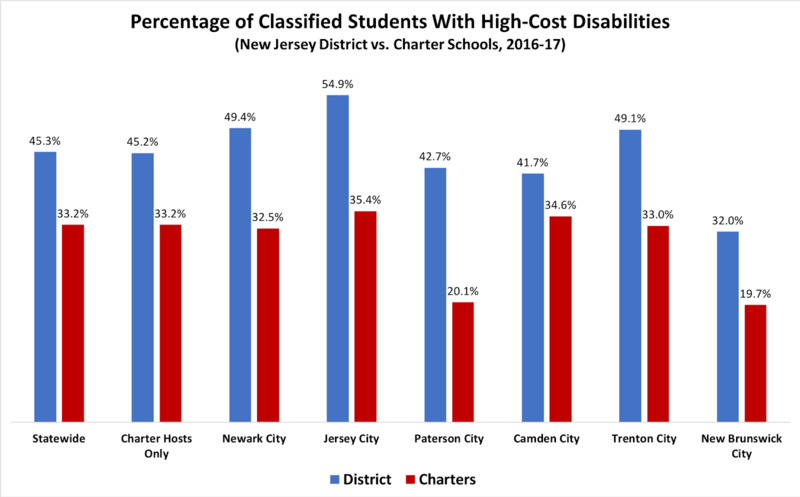 As I've shown previously, the fact that NJ charters spend far less on student support services, and have far fewer staff working in those service areas per pupil, backs up the simplest explanation: the charters don't enroll as many special needs students. You can continue to argue this point repeatedly, but it doesn't change the evidence. Jazzman: "Stephen, you accuse me of being 'severely misleading' with no empirical evidence to back up your contention. " To be more precise, I had stated that "a look at raw ongoing enrollment data can be severely misleading". Do you really dispute that? I think my extreme hypothetical illustrates how it can be misleading, and Setren's empirical evidence that I alluded to elucidates the fact that indeed in reality it sometimes is. The hyothetical alluded to a specific set of individuals eventually attaining zero SPED/ELL status. Jazzman: "Like your arguments against the evidence I've presented for cohort attrition in charters, you assume the least likely explanation on the basis of no evidence. " "The 9th grade class enrollments you examine merge students who are newly starting out and others who are repeating the grade. That distorts any attempt to compare 9th grade and 12th grade enrollment figures to measure attrition. 27.8 3.3 3.2 7.4 "
Jazzman: "As I've shown previously, the fact that NJ charters spend far less on student support services, and have far fewer staff working in those service areas per pupil, backs up the simplest explanation: the charters don't enroll as many special needs students." A properly cautious analysis would describe an adequately complete range of possible contributing factors for differing enrollment figures between schools, and hesitate to jump to conclusions, simple or otherwise. Jazzman: "You can continue to argue this point repeatedly, but it doesn't change the evidence." And perhaps we can agree that the evidence available to us is inadequate for firm, simple conclusion? Stephen, I've given clear evidence based on universally reported data. You've put up in its place an "extreme hypothetical" (your own words. You seem to value having the last word. Take it. And consider getting your own blog. Thanks for the opportunity to discuss this with you, JJ. In respect to your forthcoming piece re: LEP rates, will available NJ data allow you to compare durability of LEP status in the different sectors? And might you be able to construct graphs depicting the LEP/FLNE ratios at TPS and charter schools?